An historic study-tour by JCBT for Deaf Bible Translation Consultants happened in September, 2016. Thirteen deaf participants had access to the Land of the Bible in a 4 week intensive course. We thank God for this unique and empowering opportunity for the Sign Language translation projects in Kenya, India, Ethiopia, and the USA. 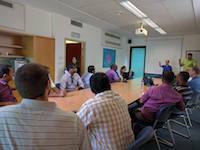 Deaf Bible Translators and Consultants visited also the Hebrew University. 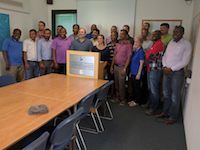 JCBT Bible Translators were warmly welcomed by Jonathan Kaplan and Eric Saranovitz for the beginning of the JCBT Study-Tour for Deaf Bible Translators and Consultants-in-Training. 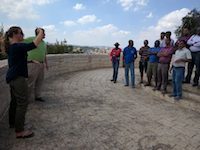 Probably a first in so many ways: for Hebrew University students that are Deaf Bible Translators coming to the Land of the Bible for an intensive month-long course. Celebrating the Lord in Jerusalem with “Singing” in Sign Language. Both Adam and Nikole Van Goor, who joined JCBT last year, know sign language. Their skills and interests continues this service for JCBT. has invited another group of Deaf Bible translators for the Land of the Bible short-term course in 26 Mar-3 Apr.